Manuel Fraga Iribarne was a Spanish politician from the northwest region of Galicia. 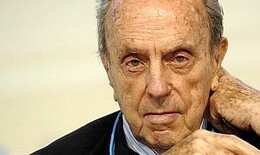 Fraga’s career in Spanish politics extended from both General Franco’s dictatorial regime to the current democracy. Fraga was Spanish Minister of Information and Tourism from 1962-1969, Spanish Minister of the Interior from 1975-1976 and Deputy for the Madrid Province within the Spanish Congress of Deputies from 1977-1989. He was the President of Galicia from 1990-2005 and also served as a Senator in the upper house of the Spanish Parliament. Fraga is one of the few distinguished figures who holds a Doctor Honoris Causa degree from the Faculty of Law of the University of Lisbon.